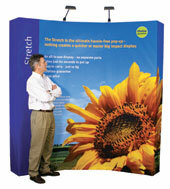 The Stretch is the ultimate hassle-free pop-up with a single full colour fabric panel that stretches open with the frame. Its the UK’s No.1 fabric pop-up and offers a more friendly, less formal look than a standard pop-up. It weights just 10kg, sets up up in 60 seconds and comes with a lifetime guarantee.